The Emory Law Volunteer Clinic for Veterans assists those who have served our country with the legal issues that they face, including claims for service-connected disability. There are more than 200,000 veterans in the Atlanta metropolitan area. 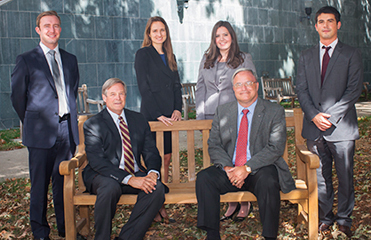 The Emory Law Volunteer Clinic for Veterans provides pro bono legal services for veterans, assisting them and their families with disability benefit claims both before the Veterans Administration and in subsequent appellate proceedings. Many of our service men and women have returned with service-related injuries and mental illnesses such as post-traumatic stress disorder (PTSD) and traumatic brain injury (TBI). Other veterans, including those who served in Vietnam and prior wars, also have disabilities associated with their prior military service as well as legal issues related to their disability claims and other civil matters. Through the active support of the Military-Veterans Section of the Georgia Bar and the Military Legal Assistance Program, the clinic was created to assist these veterans with their legal needs. The clinic commenced operations in February 2013. Over the last several years, the Georgia State Bar has encouraged law schools in the state to create legal clinics for veterans with the support of the Military Veterans Section of the Georgia Bar and the Military Legal Assistance Program Committee. At Emory Law, the National Security Law Society, led by Martin Bunt 14L and Rachel Erdman 14L (second year law students at the time), and its faculty sponsor, Charlie Shanor, decided to explore the possibility of creating a clinic for veterans. Upon establishing the need and resources for the clinic, Emory offered an adjunct professor appointment to Lane Dennard, who distinguished himself at King & Spalding by representing veterans on a pro bono basis and, together with other attorneys in the practice, has advocated for Georgia to adopt veterans court legislation. The National Security Law Society invited representatives from the well-established Veterans’ Benefits Clinic at John Marshall Law School in Chicago to conduct a two-day program focusing on its operations. John Marshall, as part of this visit, provided a three-hour training session concerning the handling of veterans’ benefits claims. Following further internal discussions focused on the resources available to Emory Law and its desire to provide the best opportunities for pro bono opportunities for students to work on veterans’ legal matters, the Emory Law Volunteer Clinic for Veterans was developed. Lane Dennard—Director Emeritus of the Clinic, Adjunct Professor, Emory Law, and retired partner with King & Spalding whose distinguished career included pro bono representation of veterans. Prior to studying law and becoming a lawyer, he served in the Army as a Captain and Company Commander in Vietnam and was awarded the Silver Star, Air Medal, Army Commendation Medal, and Purple Heart with Oak Leaf Cluster. Drew Early—co-Director of the Clinic and teaches a Veterans’ Benefits Law class. Early is one of the most experienced veterans’ law practitioners in Georgia and a former President of the Military and Veterans Benefits Law Section of the State Bar. Professor Charlie Shanor—co-Director of the Clinic, Professor of Law, Emory Law. Professor Shanor teaches Counterterrorism Law and writes about military, national security, and counterterrorism law. Keely Youngblood - Legal Fellow for the Clinic. Ms. Youngblood works as the supervising attorney for the Clinic, managing the casework and overseeing Clinic operations. She supervises students working in the clinic and provides training and support to volunteer attorneys. Ms. Youngblood graduated with Honors from Emory University School of Law in 2016, where she was a member of the Emory Law Moot Court Society and a Teaching Assistant for Advanced Legal Writing. Equal Justice Works AmeriCorps Legal Fellow—Keely Youngblood 16L. Student Co-Administrators—Emory Law students Michael Tuosto 18L and Tyler S. George 19L. A team of four volunteer students worked to promote the establishment of veterans courts in Georgia. Their work included a review of draft legislation, research on constitutional issues, and an analysis of the economic impact of veterans courts. During the 2014 legislative session, the Georgia General Assembly passed legislation allowing counties to create veterans courts. Since then, Cobb, Fulton, and Gwinnett counties, among others, have established veterans courts. Since November 2010, Lane Dennard, Lynn Adam, and Christine Hopkinson have advocated for Georgia to adopt veterans court legislation, allowing a veteran charged with a criminal offense to participate in a VA treatment program as an alternative to the traditional criminal justice system. In 2011 and 2012, the King & Spalding pro bono team proposed legislation authorizing Georgia courts to create veterans courts based on uniform criteria. Despite overwhelming support for the legislation, the veterans court legislation has not yet passed. Today, Norman Zoller is the contact for the Military Legal Assistance Program of the State Bar of Georgia. Disability claims before the Department of Veterans Affairs: Includes appeals to the Board of Veterans Appeals and the US Court of Appeals for Veterans Claims. The clinic will consider acceptance of an existing VA claim where there is a demonstrated need for legal research and/or additional fact-finding. Initial claims may be referred to the Georgia Department of Veteran Services. Pension claims before the VA: Need-based pensions and pensions that may be available to the surviving spouse and children based on the service-connected death of a veteran. Claims for increased rating before the Regional Office of the VA.
Claims for Total Disability based on Individual Unemployability (TDIU) before the VA.
Requests to reopen a claim previously denied by the VA.
Other VA issues including assistance with VA health care and VA determinations of incompetency. Applications for discharge upgrade and record correction. Employment law claims and representation: Claims by veterans under the Uniform Services Employment and Re-employment Rights Act (USERRA). The clinic will also consider providing non-litigation "preventive" advice to small non-profit organizations that represent veterans. Criminal records:The clinic will consider assisting veterans with problems associated with their records of arrest and conviction. This work includes efforts to update and correct these records, as well as expungement of the record when allowed by the Georgia statute. These activities are civil in nature and the clinic will not become involved in the underlying criminal cases. Policy issues: Includes creation of veterans courts and issues arising under the Uniform Deployed Parent's Custody and Visitation Act (UDPCVA). The clinic may consider assistance with consumer law and real property matters. The President of the National Security Society will act as liaison between the faculty and students on the assignment of cases and projects. The students in the clinic will assist faculty and other lawyers on this work. The clients are represented by the lawyers. Current cases involve disability ratings for traumatic brain injury and post-traumatic stress disorder, a petition for discharge upgrade before the Board for Correction of Naval Records, and a case before the US Court of Appeals for Veterans’ Claims. Further cases are anticipated. In addition, students work on legislative efforts to create veterans’ courts in Georgia that would allow veterans charged with criminal offenses to participate in a VA treatment program as an alternative to the traditional criminal justice system. These courts have successfully balanced needed medical treatment with assuring the safety of the community. Students looking to volunteer with the Volunteer Clinic for Veterans will need to contact Sion New or Andrew Bushek to register. Students who attended the John Marshall VA Disability training have priority in case and project assignments. Students who work in the clinic will not receive academic credit, but will receive credit for Emory Law Pro Bono hours as well as hours awarded by the Emory Public Interest Committee (EPIC). Each summer, EPIC presents up to 30 scholarships, each worth $5,000, for students who do public interest work for their summer internships. Students must complete 35+ EPIC hours to be eligible. Join the Emory Law Volunteer Clinic for Veterans and the Emory Public Interest Committee (EPIC) at Emory Law to provide veterans with advance directives and power of attorney and to handwrite thank you letters and pack care packages for local veterans. Meet at Emory Law School by 9am. Light breakfast will be provided at 8:30am. Lunch will be provided. Military Mondays are held every other Monday at the Midtown Starbucks located at 650 Ponce De Leon Ave NE #700, Atlanta, GA 30308. Veterans are encouraged to call in advance to make an appointment at 404.727.1044. To request assistance from the Clinic, contact the clinic directly at 404.727.1044. Consultations are conducted over the phone or by appointment. Please call ahead. No walk-ins accepted.